When last we read of Goldenson, he was swaying to and fro in the Hangman's noose with the photograph of Mamie Kelly clutched in his hand. After the body had hung on the scaffolding for eighteen minutes (to insure death had occurred), it was cut down by the deputies and placed in a rough wood coffin to be transported to the morgue. The coffin was loaded into the hearse outside the jailhouse door. Ten thousand people had stood in the streets outside the jail for the hanging and many of them followed the hearse as it drove rapidly to the morgue. An autopsy was conducted showing that death was instantaneous; the spinal cord having been severed and the second vertebrae fractured. An examination of the brain showed it to be normal. Once the examination was complete Goldenson's remains were transported to his parents home. It was written that while his mother was moaning and crying over his body newsboys paraded up and down in front of the house crying "all about the Goldenson hanging." Sunday afternoon, 16 September 1888, Father Fassanotti arrived at the Goldenson's home to take charge of Aleck's burial in the Catholic cemetery, the same cemetery where Mamie Kelly had been buried. On the night before the hanging, Goldenson had been baptized into the Catholic faith. For some months Goldenson and Father Fassanotti had discussed Goldenson's conversion to the Catholic faith, but it had been slow to happen for two reasons. The first was that Father Fassanotti believed in hell and Aleck did not. This was the subject of several heated arguments between the two. The second reason was that Goldenson's mother, Rebecca had threatened to committ suicide if Aleck converted. When Aleck was baptized he asked the Father to keep the information secret from his mother as long as possible. So why did Goldenson convert to Catholicism at the eleventh hour? It wasn't his friendship with Father Fassanotti, or faith, but rather his desire to spend eternity with Mamie Kelly. He must have thought he had a better chance from the Catholic Cemetery. When being pursued in the jail by the lovely young woman from Salt Lake City, Goldenson make it clear that he believed he would regain Mamie beyond the limits of life and that the two would walk the endless paths of eternity hand in hand. The Goldenson family refused to release Aleck's body to Father Fassannotti for a Catholic burial. The Father withdrew his permit for the body to be buried in the Catholic cemetery. The Goldensons then made an application to the Jewish cemetery for burial, but those in charge would not permit the burial of the body of Aleck Goldenson in Jewish ground, as he had embraced the Catholic faith prior to his death. The family then secured a lot in the Odd Fellows cemetery. The burial took place without the benefit of service. Not Catholic, not Jewish, not Protestant. Was this an omen of what was to come? Was there something missing? In a twist of fate, Aleck Goldenson's body had been returned to his family by Coroner Stanton minus Aleck's brain. During the autopsy, Stanton removed Goldenson's brain and kept it for investigation. He felt it was in the public interest to study the brain in order to refute any claim of Goldenson's insanity that might be made in the future. Both the City Attorney and District Attorney refused to defend Coroner Stanton. The court held it was the duty of the coroner to deliver the body to the family whole after the inquest. The brain was returned to the family, but there was no account of the burial of the brain. What this story doesn't tell us is how the Goldenson family discovered that the brain was missing almost two months after it had been buried. Did someone talk? And this wasn't the end of Rebecca Goldenson's time in court. The Goldenson's sued the City of San Francisco for damages alleged to have been inflicted on their property by a mob during the excitement over the murder of Mamie Kelly. They claimed $3,725.70. The Goldensons were again in court in February of 1889. It seems a man named Simon Hamberg induced Mrs. Goldenson to let him have 101 pictures and drawings made by Aleck while in jail. Hamberg sent them to Schussler Brothers in San Francisco to be framed for exhibition, but failed to pay Schussler Brothers for their work. They retained the pictures and drawings. Rebecca was suing to get the pictures back and Hamberg was convicted of swindling. I could find no disposition of Rebecca's case. Aleck was known for creating many drawings and writings while in jail. Many people wanted his autograph and he was always eager to comply. Deputy Sheriff Robert McCord while on death watch asked Goldenson for his autograph. "Certainly, Bob," replied the condemned man good-naturedly. "I'll compose an original poem for you, too." Suiting the action to the word, he sat down to his little table, and after thinking for awhile, began to write. "There you are, Bob," he said, as he finished writing. "now, that's original." My death will be a life's joy. -- My first Sunday in jail was Sunday, November 14, 1886. -- Add the letters of the Christian names Alexander and Mamie and you have fourteen. -- The same result is obtained by adding the number of letters in the surnames Kelly and Goldenson. -- The names of the attorneys who lost my case by deserting me each contains fourteen letters. -- I was fourteen months in solitary confinement. -- my trial commenced February 14, 1887. -- There are fourteen letters in the surnames Cook and Campbell, Jr., the names of the attorneys who defended me. -- Judge Murphy first passed sentence of death on me on April 14, 1887. -- I was finally sentenced to hang September 14, 188. -- My name as I sign it contains fourteen letters. This would account for Goldenson's reaction when sentenced to hang on September 14. He uttered an oath, leaned over to his attorney and said, "I told you so." In a cruel twist of fate, Goldenson was transferred to Cell 41 the day before he was hung. Fourteen backwards. Rather fitting don't you think? WAS MOTHER WHEATON JUST A COLORFUL STORY? In Prisons and Prayers, a biography written by Mrs. Elizabeth R. Wheaton, she gives this extract from a Baltimore paper, January, 1907, concerning Alexander Goldenson. For twenty years Mrs. Wheaton has been traveling throughout the United States, Europe, Canada and Mexico, working among prisoners in hundreds of prisons and penitentiaries. On a number of occasions she has converted criminals under death sentence. She has preached in the Maryland Penitentiary. Mrs. Wheaton came to Baltimore direct from Ohio, where she had been holding prayer in the cells of the state prison with eight men condemned to die she was in San Francisco a number of years ago when Alexander Goldenson killed his sweetheart, Mamie Kelly, and after Goldenson had been tried, convited and sentenced to death "Mother" Wheaton prayed with him for forty days. The day of the execution, September 14, 1888, he was converted through her instrumentality, and just before walking to the gallows she tied her silk handkerchief about the condemned man's neck. Perhaps the Baltimore reporter never read the San Francisco newspapers during the two years there were almost daily articles about Goldenson. Perhaps "Mother" Wheaton had issued a press release to the reporter or given an interview. Perhaps her perception of the time she spent with Goldenson was markedly different than the reality. Perhaps a story just gets better over time. Mother Wheaton, didn't correct the article and even used it in her biography. Is there evidence that "Mother Wheaton" actually spent time with Goldenson on death row and that any of her claims were based on fact. On the day of Goldenson's hanging the San Francisco Daily Evening Bulletin reported that two evangelists who had visited him for several months were there that morning. They were not named, but were referred to as "the Sisters." They sang and prayed with the prisoner for several hours. Goldenson's favorite songs were listed as "Where is My Wandering Boy Tonight," "Meet Me There," and "Jesus Hallelujah." Upon leaving, the elder Sister (Mother Wheaton?) had tears in her eyes and left Goldenson with these parting words, "Rest quietly and try to think of yourself as you are and may God bless you." Once they were gone Goldenson laughingly imitated their singing. "That's pretty good for a fellow with one foot in the grave, isn't it," he remarked with tears of laughter rolling down his cheeks. It is well documented in the newspapers that Father Francotti baptized Goldenson into the Catholic faith and no documentation that "Mother Wheaton" was the instrumentality. It is also well documented that Goldenson was not wearing a handkerchief around his neck when he went to the gallows. It was a collar and tie that he himself removed to place the noose around his neck. It is also well documented that "Mother Wheaton" was not there when he walked to the gallows as she had left earlier that morning. There is mention of a handkerchief in Goldenson's pocket, but no mention of who had given it to him. So it looks as if the prison advocate, "Mother Wheaton," may have been padding her resume or the San Francisco newspapers did not find her as colorful or interesting as she found herself. N. E. Cor. POLK STREET AND ASH AVE. This brochure opens to 8 panels: Front with photo of church and a listing of George Washington and Robert E Lee's Pews. Nest panal gives history of building the church. Next panal is History of George Washington and the church. Next panal is Robert E Lee and the church. Next panal speaks of Organs Chandelier Halls Tombstones in the Cemetary and the history of the church in the war between the stat I don't know the name of the type so this could be miscatagorized. It seems like your average photo of 1886. Then the interesting part is on the back. It asks for forgiveness for her slayer and says she was shot on Nov 10 1886. Bid high as this is being sold to save my home. I read the description to the end and was curious about the forgiveness for the person who shot her. It is a typical communion photograph of the 1880s, with a twist. I also collect a category of photograph I describe as "weird, strange, or unusual. " The communion/memorial photograph of Mamie Kelly fit that category and held quite a story. 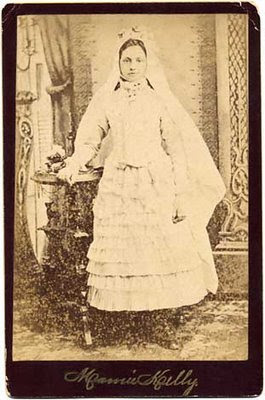 At the time of Mamie's funeral the stamped religious information was added to the reverse of the photograph so that it would function as a memorial card. What does it all mean? J!M!J! stands for Jesus, Mary Joseph. The heart at the bottom on the left that has both the crown of thorns and the flame above it is known as the Sacred Heart of Jesus. I am not Catholic, but it appears there is a Litany of the Sacred Heart of Jesus and this may have been said at Mamie's funeral. There are also twelve promises associated with the Sacred Heart some of which are peace to the family, consolation in their troubles, refuge in death. All of which would be appropriate for a funeral. The heart pictured on the right pierced by the sword is the Immaculate Heart of Mary. Its significance appears to be intersession with Christ and a shared sorrow. Also appropriate for a mourning card. With special thanks to Donna Pointkouski, What's Past Is Prologue, for her knowledge and research. Truth, Justice, and Mercy are found in Psalm 85:10, as the foundational elements of reconciliation offering peace. Appropriate under the circumstances of Mamie's death. The term agonizing hearts is found in many of the eulogies of this time period referring to the friends and family left behind and is therefore not unusual. The card appears to encourage Christian charity toward Mamie's murderer. There are several mysteries associated with the cabinet card, however. Who was the photographer? Normally an imprint would be found at the bottom of the front of the photograph. Here instead we have a facsimile of Mamie's signature. A photographer's imprint might also be found on the reverse of the card, but the card was blank and stamped with the memorial information. As Maureen Taylor has suggested in a recent article, perhaps a comparison of the background in this photograph to the backgrounds used by the photographers in San Francisco during this period of time might be helpful. But backgrounds were commercially sold and purchased by many photographers. As I don't have access to photographs of all the photographers in business in San Francisco at that time (there were many) this would not be helpful. Also, any photographer in the city might have made a copy of the original photograph to produce this memorial card. Who paid for the photograph used as a memorial card? In my discussions with Donna, she remarked that it was probably not something the church would have paid for. In the Dicy Cannon article, Shades discussed the fact that memorial cards generally were the function of the mortuary or a mail-order service to the family. The funeral happened very quickly too quickly for mail-order and the memorial card was not the type normally available by mail. The newspaper articles described the body as having been taken from the autopsy directly to the Kelly home, no mortuary is mentioned. The mortuary may have facilitated this for the family, but it could not have accomplished it without the family's assistance. Note the signature of Mamie Kelly on the front of the photograph. Mamie may have autographed one for a friend or family member and the photographer used that photograph to accomplish the copy you see here. I believe the memorial photograph was most probably produced by the family. At first, I questioned how the family could afford to pay for the photograph knowing the number of people who attended the service and would have wanted a copy of the memorial. However, the Daily Evening Bulletin wrote an article about the token of Mrs. Kelly's gratitude to the prosecutor, Mr. Regensberger, for his prosecution and conviction of Goldenson. The token was a large plush covered arm chair, a very expensive item. I found no information concerning the origin of the photograph in my research. The real questions are "How did Aleck Goldenson obtain the photograph that he took to the gallows tied to his wrist. Was it a memorial photograph or was it the original communion photograph?" Now that's a mystery I'd love to solve! Duke, Thomas S. Celebrated Criminal Cases of America. Tabor, San Francisco: The James H. Barry Co., 1910. Also available online at http://books.google.com/. McCarty, L. P. The Annual Statistician and Economist. San Francisco: Pacific Press, 1892. Also available online at http://books.google.com/. O'Brien, Robert. This is San Francisco. New York: Whittlesey House, 1948. Also available online at http://books.google.com/. Wheaton, Elizabeth (Ryder). Prisons and Prayer: Or A Labor of Love. Tabor, Iowa: Chas. M. Kelley, 1906. Also available online at http://books.google.com/. Poinkowski, Donna. 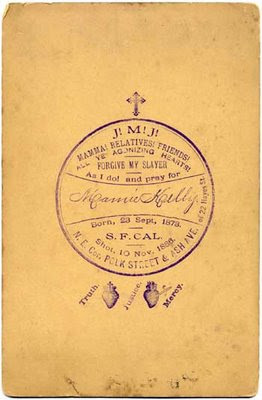 "Response to questions on Mamie Kelly Memorial Card." E-mail message to footnoteMaven, January 2009. Unknown. "Yesterday Murder." Daily Evening Bulletin, 11 November 1886. Online archives King County Library Infotrac Gale Group - Subscription. http://infotrac.galegroup.com : 2009. Unknown. "Irritated by Her Importunities." St. Louis Globe-Democrat, 11 November 1886. Online archives King County Library Infotrac Gale Group - Subscription. http://infotrac.galegroup.com : 2009. Unknown. "Killed a School Girl." Morning Oregonian, 11 November 1886. Online archives King County Library Infotrac Gale Group - Subscription. http://infotrac.galegroup.com : 2009. Unknown. "Cold-Blooded Murder." Daily Evening Bulletin, 12 November 1886. Online archives King County Library Infotrac Gale Group - Subscription. http://infotrac.galegroup.com : 2009. Unknown. "Crime and Casualties." The Atchison Daily Champion, 13 November 1886. Online archives King County Library Infotrac Gale Group - Subscription. http://infotrac.galegroup.com : 2009. Unknown. "The Tumult Last Night." Daily Evening Bulletin, 13 November 1886. Online archives King County Library Infotrac Gale Group - Subscription. http://infotrac.galegroup.com : 2009. Unknown. "A Mob Repulsed " St. Louis Globe-Democrat, 13 November 1886. Online archives King County Library Infotrac Gale Group - Subscription. http://infotrac.galegroup.com : 2009. Unknown. "Tried To Lynch Him." Daily Evening Bulletin, 13 November 1886. Online archives King County Library Infotrac Gale Group - Subscription. http://infotrac.galegroup.com : 2009. Unknown. "The Recent Murder." The Milwaukee Sentinel, 11 November 1886. Online archives King County Library Infotrac Gale Group - Subscription. http://infotrac.galegroup.com : 2009. Unknown. "A Mild Mannered Mob." Daily Evening Bulletin, 13 November 1886. Online archives King County Library Infotrac Gale Group - Subscription. http://infotrac.galegroup.com : 2009. Unknown. "Lynchers Foiled." The News and Observer, 14 November 1886. Online archives King County Library Infotrac Gale Group - Subscription. http://infotrac.galegroup.com : 2009. Unknown. "Mamie Kelly's Murderer " The Galveston Daily News, 14 November 1886. Online archives King County Library Infotrac Gale Group - Subscription. http://infotrac.galegroup.com : 2009. Unknown. "Murdered Mamie Kelly." The Daily Inter Ocean, 14 November 1886. Online archives King County Library Infotrac Gale Group - Subscription. http://infotrac.galegroup.com : 2009. Unknown. "Tried To Lynch Him." The Milwaukee Sentinel, 14 November 1886. Online archives King County Library Infotrac Gale Group - Subscription. http://infotrac.galegroup.com : 2009. Unknown. "The Mamie Kelly's Murder." The Milwaukee Sentinel, 14 November 1886. Online archives King County Library Infotrac Gale Group - Subscription. http://infotrac.galegroup.com : 2009. Unknown. "Goldenson In Court." Daily Evening Bulletin, 18 November 1886. Online archives King County Library Infotrac Gale Group - Subscription. http://infotrac.galegroup.com : 2009. Unknown. "Crime In Frisco." The Los Angeles Times, 21 November 1886. Online archives King County Library Infotrac Gale Group - Subscription. http://infotrac.galegroup.com : 2009. Unknown. "The Goldenson Case." Daily Evening Bulletin, 23 November 1886. Online archives King County Library Infotrac Gale Group - Subscription. http://infotrac.galegroup.com : 2009. Unknown. "Arraigned." Daily Evening Bulletin, 24 November 1886. Online archives King County Library Infotrac Gale Group - Subscription. http://infotrac.galegroup.com : 2009. Unknown. "The Case of Goldenson In Police Court." Daily Evening Bulletin, 26 November 1886. Online archives King County Library Infotrac Gale Group - Subscription. http://infotrac.galegroup.com : 2009. Unknown. "Goldenson's Defense." Daily Evening Bulletin, 1 December 1886. Online archives King County Library Infotrac Gale Group - Subscription. http://infotrac.galegroup.com : 2009. Unknown. "The Goldenson Case." Daily Evening Bulletin, 4 December 1886. Online archives King County Library Infotrac Gale Group - Subscription. http://infotrac.galegroup.com : 2009. Unknown. "Mamie Kelly's Murderer." The Los Angeles Times, 5 December 1886. Online archives King County Library Infotrac Gale Group - Subscription. http://infotrac.galegroup.com : 2009. Unknown. "Goldenson's Case." Daily Evening Bulletin, 7 December 1886. Online archives King County Library Infotrac Gale Group - Subscription. http://infotrac.galegroup.com : 2009. Unknown. "Commissioner's Appointed." Daily Evening Bulletin, 9 December 1886. Online archives King County Library Infotrac Gale Group - Subscription. http://infotrac.galegroup.com : 2009. Unknown. "Awaiting Trial." Daily Evening Bulletin, 11 December 1886. Online archives King County Library Infotrac Gale Group - Subscription. http://infotrac.galegroup.com : 2009. Unknown. "Goldenson's Crime." Daily Evening Bulletin, 6 January 1887. Online archives King County Library Infotrac Gale Group - Subscription. http://infotrac.galegroup.com : 2009. Unknown. "The Status of the Goldenson Case." Daily Evening Bulletin, 17 January 1887. Online archives King County Library Infotrac Gale Group - Subscription. http://infotrac.galegroup.com : 2009. Unknown. "The Goldenson Case." Daily Evening Bulletin, 8 February 1887. Online archives King County Library Infotrac Gale Group - Subscription. http://infotrac.galegroup.com : 2009. Unknown. "The Goldenson Case." Daily Evening Bulletin, 14 February 1887. Online archives King County Library Infotrac Gale Group - Subscription. http://infotrac.galegroup.com : 2009. Unknown. "The Goldenson Case." Daily Evening Bulletin, 16 February 1887. Online archives King County Library Infotrac Gale Group - Subscription. http://infotrac.galegroup.com : 2009. Unknown. "No More Delays." The Los Angeles Times, 17 February 1887. Online archives King County Library Infotrac Gale Group - Subscription. http://infotrac.galegroup.com : 2009. Unknown. "The Prisoner Refuses To Talk." Daily Evening Bulletin, 18 February 1887. Online archives King County Library Infotrac Gale Group - Subscription. http://infotrac.galegroup.com : 2009. Unknown. "Judge Murphy Insists That The Trial Must Proceed." Daily Evening Bulletin, 21 February 1887. Online archives King County Library Infotrac Gale Group - Subscription. http://infotrac.galegroup.com : 2009. Unknown. "The Slayer of Mamie Kelly At Last Brought To Trial." The Los Angeles Times, 22 February 1887. Online archives King County Library Infotrac Gale Group - Subscription. http://infotrac.galegroup.com : 2009. Unknown. "The Work Of Impaneling The Jury." Daily Evening Bulletin, 23 February 1887. Online archives King County Library Infotrac Gale Group - Subscription. http://infotrac.galegroup.com : 2009. Unknown. "Only Part Of The Trial Jury Secured." Daily Evening Bulletin, 24 February 1887. Online archives King County Library Infotrac Gale Group - Subscription. http://infotrac.galegroup.com : 2009. Unknown. "An Attempt To Resume The Impaneling of Jurors." Daily Evening Bulletin, 25 February 1887. Online archives King County Library Infotrac Gale Group - Subscription. http://infotrac.galegroup.com : 2009. Unknown. "Objections Introduced By Counsel." Daily Evening Bulletin, 7 March 1887. Online archives King County Library Infotrac Gale Group - Subscription. http://infotrac.galegroup.com : 2009. Unknown. "Testimony Taken." Daily Evening Bulletin, 8 March 1887. Online archives King County Library Infotrac Gale Group - Subscription. http://infotrac.galegroup.com : 2009. Unknown. "Misguided Men." Los Angeles Times, 8 March 1887. Online archives King County Library Infotrac Gale Group - Subscription. http://infotrac.galegroup.com : 2009. Unknown. "Written Statement Made By Defendent." Daily Evening Bulletin, 9 March 1887. Online archives King County Library Infotrac Gale Group - Subscription. http://infotrac.galegroup.com : 2009. Unknown. "Outline By Counsel of The Claim." Daily Evening Bulletin, 10 March 1887. Online archives King County Library Infotrac Gale Group - Subscription. http://infotrac.galegroup.com : 2009. Unknown. "The Taking Of Testimony." Daily Evening Bulletin, 11 March 1887. Online archives King County Library Infotrac Gale Group - Subscription. http://infotrac.galegroup.com : 2009. Unknown. "A Murder's Relatives In Contempt." St. Louis-Globe Democrat, 11 March 1887. Online archives King County Library Infotrac Gale Group - Subscription. http://infotrac.galegroup.com : 2009. Unknown. "Deuprey Answers." Daily Evening Bulletin, 15 March 1887. Online archives King County Library Infotrac Gale Group - Subscription. http://infotrac.galegroup.com : 2009. Unknown. "Evidence Introduced To Show Prisoner's Mental Condition." Daily Evening Bulletin, 17 March 1887. Online archives King County Library Infotrac Gale Group - Subscription. http://infotrac.galegroup.com : 2009. Unknown. "No Title." The Idaho Avalanche, 19 March 1887. Online archives King County Library Infotrac Gale Group - Subscription. http://infotrac.galegroup.com : 2009. Unknown. "Beginning Of The End." Daily Evening Bulletin, 25 March 1887. Online archives King County Library Infotrac Gale Group - Subscription. http://infotrac.galegroup.com : 2009. Unknown. "No Title." Los Angeles Times, 26 March 1887. Online archives King County Library Infotrac Gale Group - Subscription. http://infotrac.galegroup.com : 2009. Unknown. "Goldenson Convicted." The Atchison Daily Globe, 29 March 1887. Online archives King County Library Infotrac Gale Group - Subscription. http://infotrac.galegroup.com : 2009. Unknown. "Murder In The First Degree." The Milwaukee Sentinel, 29 March 1887. Online archives King County Library Infotrac Gale Group - Subscription. http://infotrac.galegroup.com : 2009. Unknown. "Goldenson Guilty." The Los Angeles Times, 29 March 1887. Online archives King County Library Infotrac Gale Group - Subscription. http://infotrac.galegroup.com : 2009. Unknown. "Guilty of Murder in the First Degree." Bangor Daily Whig & Courier, 30 March 1887. Online archives King County Library Infotrac Gale Group - Subscription. http://infotrac.galegroup.com : 2009. Unknown. "CONVICTION." Los Angeles Times, 30 March 1887. Online archives King County Library Infotrac Gale Group - Subscription. http://infotrac.galegroup.com : 2009. Unknown. "Goldenson." Los Angeles Times, 31 March 1887. Online archives King County Library Infotrac Gale Group - Subscription. http://infotrac.galegroup.com : 2009. Unknown. "San Francisco Criminals." The Los Angeles Times, 3 April 1887. Online archives King County Library Infotrac Gale Group - Subscription. http://infotrac.galegroup.com : 2009. Unknown. "Motion For A New Trial." Daily Evening Bulletin, 9 April 1887. Online archives King County Library Infotrac Gale Group - Subscription. http://infotrac.galegroup.com : 2009. Unknown. "Goldenson Wants A New Trial." The Los Angeles Times, 10 April 1887. Online archives King County Library Infotrac Gale Group - Subscription. http://infotrac.galegroup.com : 2009. Unknown. "Latest News Items." Daily Evening Bulletin, 11 April 1887. Online archives King County Library Infotrac Gale Group - Subscription. http://infotrac.galegroup.com : 2009. Unknown. "Goldenson To Hang." Daily Evening Bulletin, 14 April 1887. Online archives King County Library Infotrac Gale Group - Subscription. http://infotrac.galegroup.com : 2009. Unknown. "Good-bye Goldenson." Bismark Daily Tribune, 15 April 1887. Online archives King County Library Infotrac Gale Group - Subscription. http://infotrac.galegroup.com : 2009. Unknown. "Goldenson's Doom." The Los Angeles Times, 15 April 1887. Online archives King County Library Infotrac Gale Group - Subscription. http://infotrac.galegroup.com : 2009. Unknown. "Goldenson's Appeal." The Los Angeles Times, 24 April 1887. Online archives King County Library Infotrac Gale Group - Subscription. http://infotrac.galegroup.com : 2009. Unknown. "Gift From Mrs. Kelly." Daily Evening Bulletin, 25 April 1887. Online archives King County Library Infotrac Gale Group - Subscription. http://infotrac.galegroup.com : 2009. Unknown. "A Lease Of Life To Assassins." Morning Oregonian, 27 May 1887. Online archives King County Library Infotrac Gale Group - Subscription. http://infotrac.galegroup.com : 2009. Unknown. "Goldenson's Appeal." Daily Evening Bulletin, 5 July 1887. Online archives King County Library Infotrac Gale Group - Subscription. http://infotrac.galegroup.com : 2009. Unknown. "Set For Trial." Daily Evening Bulletin, 27 September 1887. Online archives King County Library Infotrac Gale Group - Subscription. http://infotrac.galegroup.com : 2009. Unknown. "The Unusual Criminal Activity At San Francisco." The Los Angeles Times, 5 November 1887. Online archives King County Library Infotrac Gale Group - Subscription. http://infotrac.galegroup.com : 2009. Unknown. "Jury Fixers." The Los Angeles Times, 25 April 1887. Online archives King County Library Infotrac Gale Group - Subscription. http://infotrac.galegroup.com : 2009. Unknown. "Misplaced Pity." The Idaho Avalanche, 28 April 1888. Online archives King County Library Infotrac Gale Group - Subscription. http://infotrac.galegroup.com : 2009. Unknown. "Goldenson Must Hang." Morning Oregonian, 26 May 1888. Online archives King County Library Infotrac Gale Group - Subscription. http://infotrac.galegroup.com : 2009. Unknown. "He Will Hang." The Los Angeles Times, 26 May 1888. Online archives King County Library Infotrac Gale Group - Subscription. http://infotrac.galegroup.com : 2009. Unknown. "Multiple News Items." The Idaho Avalanche, 2 June 1888. Online archives King County Library Infotrac Gale Group - Subscription. http://infotrac.galegroup.com : 2009. Unknown. "Goldenson Asks For a Writ." Daily Evening Bulletin, 28 June 1888. Online archives King County Library Infotrac Gale Group - Subscription. http://infotrac.galegroup.com : 2009. Unknown. "Goldenson's Last Hope Gone." Morning Oregonian, 10 July 1888. Online archives King County Library Infotrac Gale Group - Subscription. http://infotrac.galegroup.com : 2009. Unknown. "Multiple News Items." Daily Evening Bulletin, 12 July 1888. Online archives King County Library Infotrac Gale Group - Subscription. http://infotrac.galegroup.com : 2009. Unknown. "Events In Californias." Morning Oregonian, 12 July 1888. Online archives King County Library Infotrac Gale Group - Subscription. http://infotrac.galegroup.com : 2009. Unknown. "Multiple News Items." The Los Angeles Times, 12 July 1888. Online archives King County Library Infotrac Gale Group - Subscription. http://infotrac.galegroup.com : 2009. Unknown. "Goldenson's Fate." Daily Evening Bulletin, 14 July 1888. Online archives King County Library Infotrac Gale Group - Subscription. http://infotrac.galegroup.com : 2009. Unknown. "Multiple News Items." Daily Evening Bulletin, 21 July 1888. Online archives King County Library Infotrac Gale Group - Subscription. http://infotrac.galegroup.com : 2009. Unknown. "Goldenson's Fatal Day." Daily Evening Bulletin, 23 July 1888. Online archives King County Library Infotrac Gale Group - Subscription. http://infotrac.galegroup.com : 2009. Unknown. "Goldenson's Death Warrant Signed." Los Angeles Times, 25 July 1888. Online archives King County Library Infotrac Gale Group - Subscription. http://infotrac.galegroup.com : 2009. Unknown. "Goldenson's Denial." Daily Evening Bulletin, 17 August 1888. Online archives King County Library Infotrac Gale Group - Subscription. http://infotrac.galegroup.com : 2009. Unknown. "A Death Watch For Goldenson." Morning Oregonian, 29 August 1888. Online archives King County Library Infotrac Gale Group - Subscription. http://infotrac.galegroup.com : 2009. Unknown. "Guarding Goldenson." Los Angeles Times, 29 August 1888. Online archives King County Library Infotrac Gale Group - Subscription. http://infotrac.galegroup.com : 2009. Unknown. "A Shrewd Move." Daily Evening Bulletin, 7 September 1888. Online archives King County Library Infotrac Gale Group - Subscription. http://infotrac.galegroup.com : 2009. Unknown. "The Sheriff Preparing For His Execution." Daily Evening Bulletin, 12 September 1888. Online archives King County Library Infotrac Gale Group - Subscription. http://infotrac.galegroup.com : 2009. Unknown. "The End." Daily Evening Bulletin, 14 September 1888. Online archives King County Library Infotrac Gale Group - Subscription. http://infotrac.galegroup.com : 2009. Unknown. "Extra Hanged!" Daily Evening Bulletin, 14 September 1888. Online archives King County Library Infotrac Gale Group - Subscription. http://infotrac.galegroup.com : 2009. Unknown. "To Hang Today." The Los Angeles Times, 14 September 1888. Online archives King County Library Infotrac Gale Group - Subscription. http://infotrac.galegroup.com : 2009. Unknown. "Not Afraid of Death." Morning Oregonian, 15 September 1888. Online archives King County Library Infotrac Gale Group - Subscription. http://infotrac.galegroup.com : 2009. Unknown. "A Young Murderer Executed." Rocky Mountain News, 15 September 1888. Online archives King County Library Infotrac Gale Group - Subscription. http://infotrac.galegroup.com : 2009. Unknown. "Goldenson Hanged." The Atchison Daily Globe, 15 September 1888. Online archives King County Library Infotrac Gale Group - Subscription. http://infotrac.galegroup.com : 2009. Unknown. "Goldenson Hanged." The Milwaukee Sentinel, 15 September 1888. Online archives King County Library Infotrac Gale Group - Subscription. http://infotrac.galegroup.com : 2009. Unknown. "Goldenson's Faith." The Los Angeles Times, 16 September 1888. Online archives King County Library Infotrac Gale Group - Subscription. http://infotrac.galegroup.com : 2009. Unknown. "Without Rites." Los Angeles Times, 17 September 1888. Online archives King County Library Infotrac Gale Group - Subscription. http://infotrac.galegroup.com : 2009. Unknown. "Goldenson's Brain." Daily Evening Bulletin, 14 November 1888. Online archives King County Library Infotrac Gale Group - Subscription. http://infotrac.galegroup.com : 2009. Unknown. "Goldenson's Pictures." Daily Evening Bulletin, 7 September 1888. Online archives King County Library Infotrac Gale Group - Subscription. http://infotrac.galegroup.com : 2009. Mamie Kelly. San Francisco, CA. Cabinet Card. 1886. Privately held by the footnoteMaven, Preston, Washington. 2009. Bravo fM! A most excellent story. I believe Rod Stewart now when he sings "Every Picture Tells A Story"
Yes, but who would have thought this much story? I can't believe how many twists and turns this story had! Strange and fascinating. If you can believe this, there's even more. Another prisoner who became jealous of Goldenson's celebrity and a younger brother who was started down the same path. But the story had to end somewhere. You never know when you pick up a photograph where it will lead you. fM - Very interesting story & thanks so much for sharing it. I wonder if there are any descendents of the Kelly family who might possibly stumble upon this and read such an excellent review of these tragic events. 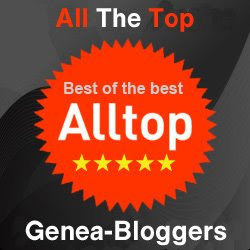 What a brilliant Arbeit you have shared with us! Thank you so much once again fM. This is absolutely fascinating. How Your Grandmother Did It! That Simple Little Postcard Connects Again!